Two years ago, then-Wales manager Gary Speed finished his Saturday lunchtime obligations on Football Focus and swapped the studio lights for floodlights. He took in one of his former teams, Newcastle United, playing Manchester United at Old Trafford. The following morning, just after 07:00 GMT on 27 November 2011, his wife Louise found him hanged at their home in Huntington, Chester. He was 42 and also left behind his two boys, Tommy and Ed. The news shocked the world of football. Now, two years on, the former player's father is convinced that conditions have improved for footballers needing help. But Roger Speed says he and his wife Carol are still no nearer to finding out why his son did what he did. "He didn't even come to us, mention anything to us at all about anything. It was just out of the blue... if he had just done that," says Roger. "We don't know why and Carol says that's all that's bothering her... why? She can't find out why, and I don't think we'll ever find out now, so we just have to carry on, fight it." Speaking to Sportshour on the BBC World Service, Roger Speed explains the cathartic nature of talking about his son and raising awareness of mental health issues: "It's been immensely helpful to talk, but it's not the same with Carol, you know a mother's son and everything. "I would think it's a lot harder for the mother, but she is getting a bit better every day. It's hard, very hard for her." It's clear that Roger has spent considerable time looking for answers, speaking to those who were closest to Gary. "Gary had so many friends in football, why didn't he have a word with one of those? I spoke to all of them, and they were very, very shocked and surprised and I thought 'well, why is it, you were his mates?' They couldn't understand why he never asked anybody at all to help him. He would help anybody, anybody, but he wouldn't ask for [help] himself." As grandparents, Roger and Carol spend plenty of time with Gary's sons, who were aged 13 and 14 respectively at the time of their father's death. Roger often takes them to play sport. Footballer Ed has been capped for Wales Under-16s and Tommy plays golf. "We don't talk a lot about it. I just say 'don't forget who is up there watching you' and they say 'yeah we know'. They haven't mentioned about missing him yet, but I think that might come later on." The silence is a symptom for many who suffer with depression, so encouraging people to talk about the issues affecting them has driven Roger and a foundation set up in Gary's memory. 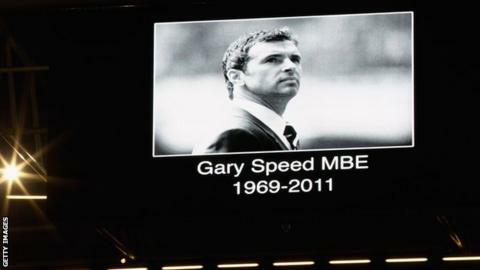 "We set up the Gary Speed Trust fund. The first donation was for a charity called Console, a suicide charity in Dublin. Carol did an interview on TV about Console, and apparently the day after they received a call and they saved a boy's life and it was in his mind to take his own life but he didn't do it, and I thought that's absolutely fantastic and in one programme we saved one life, so it is working." Roger is happy there is more support for footballers and cites the work of former Professional Footballers' Association chairman Clarke Carlisle in raising the profile of depression among sportspeople, including a BBC programme called Football's Suicide Secret. "I believe there's a charity going on through him, so there is more help coming through since this has happened for footballers who are getting a bit desperate," said Roger. "You don't know the pressure Gary was under and he wouldn't let it out with him being high profile. We don't know whether he was under pressure or what, so this is what these charities are for we hope, to help footballers come out and speak." You can listen to the full interview on the BBC World Service Sportshour podcast here.